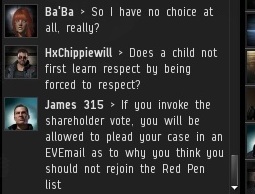 Previously, on MinerBumping... Highsec ice miner Ba'Ba, once a member of the disgraced Red Pen list for the crime of petitioning CCP to ban me, had become a poster child for the New Order's power to reform and forgive the errant. But when Ba'Ba began expressing unorthodox views about the New Order, the Supreme Protector launched an investigation. 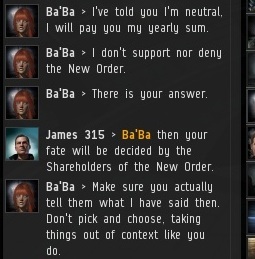 After being put to the question, Ba'Ba revealed a tendency toward dangerous thoughts about her place in highsec. 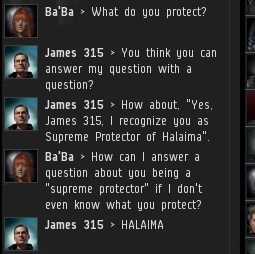 I offered her an easy way out: Simply recognize me as Supreme Protector. 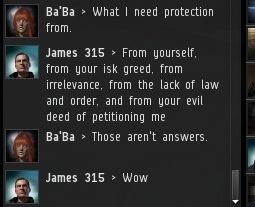 It's easier to type "yes" in local than to pay 30 million isk. 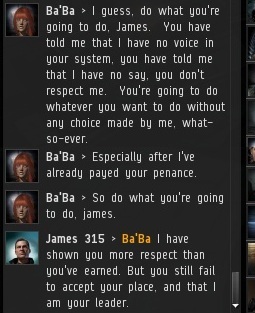 She had paid the isk, so why couldn't she say the words? The invitation to affirm her place in the New Order was declined too many times. There was no mistaking it: Something was rotten in the state of Ba'Ba. 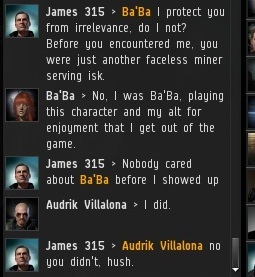 Ba'Ba demanded to know what I was protecting her and other miners from. I answered, but she didn't like the answers, so she dismissed them. She even showed signs of not fully accepting responsibility for the punishment she had received. While continuing to be evasive, Ba'Ba nonetheless made one thing perfectly clear: She'd rather declare neutrality than allegiance. In danger of having her privileges revoked, Ba'Ba asked what crime she had committed to warrant such a revocation. 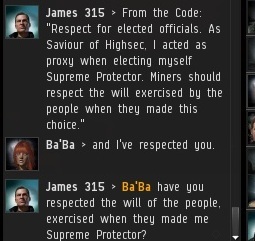 The answer was obvious: To obey the Code, one must recognize the authority of the Supreme Protector and Saviour of Highsec. As time went on, Ba'Ba displayed more similarities to the rebels. They, too, often complain that they didn't have the chance to vote on my authority. In refusing to recognize the Supreme Protector when given (more than) ample opportunity, Ba'Ba had committed a serious violation of the Code--and a grave error. Yet my mercy was still not totally spent. 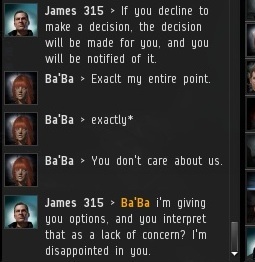 Ba'Ba was given a choice on how the matter would be settled. In a cringe-inducing breach of decorum and protocol, Ba'Ba insulted the very shareholders she would need to rely upon for mercy. She claimed it was no choice, because she had no faith in the fair-mindedness of the shareholders. Even after all this, Ba'Ba was insolent and ungrateful. This was one miner who had a lot of growing up to do. 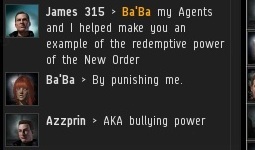 Ba'Ba refused to choose between the two options, throwing my mercy back in my face. ...And she still refused to learn from her mistakes, preferring the path of stubbornness to the path of wisdom. Ba'Ba was unrepentant to the last. The next step in her journey was to be decided by the Shareholders of the New Order. Ba'Ba sent me an EVEmail in which she plead her case to the voters. This EVEmail will be presented in its entirety, after which it will be time to vote. Surely if Ba'Ba wants a voice, she should simply buy some shares? Once again she ignores the options presented to her. I think everyone knows what decision she will get. 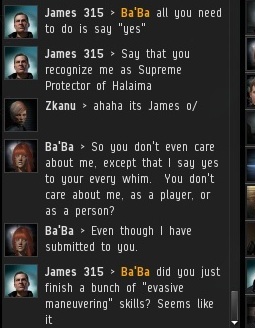 This is like a train-wreck in that I can't help but watch and I don't even play Eve. You and every high sec ice miner. Pootis Man, I hope you mean to say that the shareholders will vote and most likely decide that Ba'Ba has broken the code. 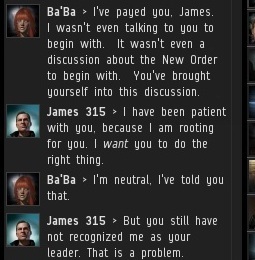 After all, James 315 always stands for the code, above all else. Just bought my shares so I can vote on this extremely important issue.